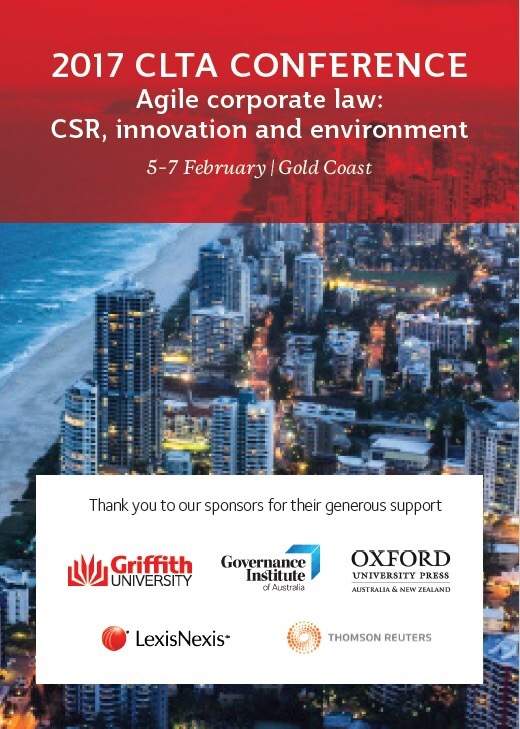 Five members of the University of Adelaide Law School attended at the CLTA 2017 Conference from 5-7 February, held at Griffith University Gold Coast Campus, entitled “Agile Corporate Law: CSR, Innvoation and Environment”. The conference commenced on the Sunday with a discussion of “Digital Disruption and Student Engagement”, where Professor Chris Symes joined a panel of colleagues from various universities to engage with the question of the difficulties of teaching corporate law in a digital era. Monday began with a keynote address from Professor Sally Wheeler, Head of Law at Queen’s University, Belfast, Ireland,who suggested that corporations’ social legitimacy is under threat in the modern age, and urged corporations to be more proactive in building dialogue and fostering mutuality, which goes beyond current CSR frameworks. Professor Wheeler suggested that corporate law should look to extend consideration to corporate social responsiveness, not just responsibility. Professor Pamela Hanrahan, Deputy Head of the School of Taxation and Business Law at the University of New South Wales responded, asking whether we will look back on 2016 as a historical tipping point between the state, corporation and society, such as has previously been witnessed under FD Roosevelt and Margaret Thatcher. Tuesday commenced with a panel discussion on Innovation and Sustainability, where the views of academics, the judiciary and ASIC were represented in a lively discussion. Associate Professor Suzanne Le Mire remains a member of the CLTA Executive for 2017, and has been joined by Dr Nosworthy, continuing the University of Adelaide’s long history with this academic body. We look forward to contributing to the next CLTA conference in 2018! This entry was posted in Events, Research and tagged adelaide law school, Associate Professor Suzanne Le Mire, Corporate and Commercial Law, Corporate Law Teachers Association Conference 2017, Dr Beth Nosworthy, Dr Franc de Zwart, Events, Professor Chris Symes, ROCIT. Bookmark the permalink.